Blepharospasm is a dystonia where the muscle that closes the eye (orbicularis oculi) contracts uncontrollably. The condition can be severe enough to cause traffic accidents when the patient is suddenly unable to open their eyes to see. The eyes can still be closed voluntarily. The neurological defect is felt to be in the portion of the brain known as the basal ganglia. Many patients are initially diagnosed as having dry eyes, tics, or simply excessive but normal blinking. The treatment of choice for this condition is botulinum toxin injections of the orbicularis oculi muscles (the muscle that causes the eyes to close). There are four forms of botulinum toxin available for treatment, type A includes Botox®, Dysport® and Xeomin®, and type B is Myobloc®. A treatment typically lasts 3 – 6 months. Botulinum toxin requires binding to Zinc in order to function. Dr. Soparker and associates demonstrated that the use of Zytaze (a combination of Zinc and phytase) resulted in extending the benefit of botulinum toxin (at least Botox brand for blepharospasm and forehead wrinkles). 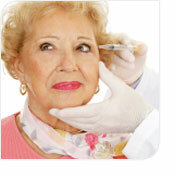 Given the low cost, Dr. Loftus recommends all of his patients use Zytaze when using botox for blepharospasm. Anticholinergic medications and some benzodiazepene medications can be prescribed as an alternate therapy if the patient does not respond to botulinum toxin injection therapy.